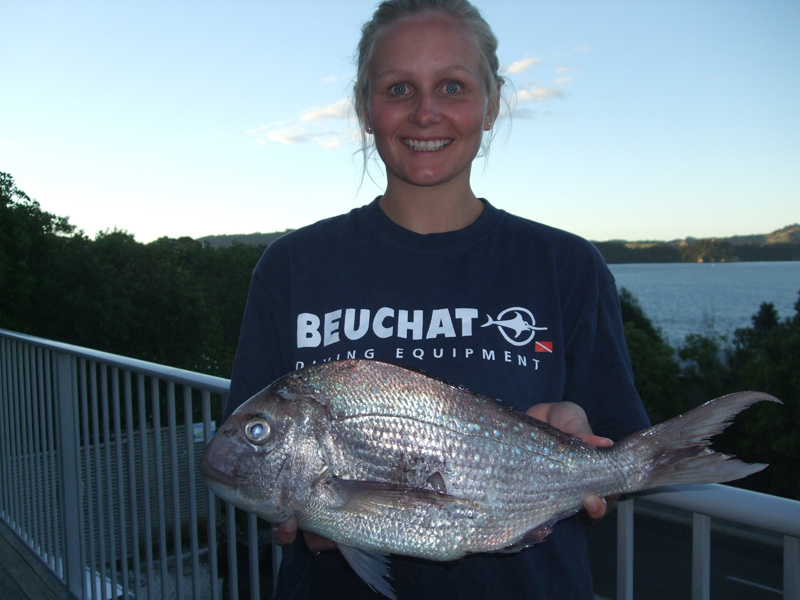 Our coverage of the Interpacific Spearfishing Championships continues now thanks to Adreno's Sponsored Spearfisher Kahlee Andrews who is in NZ representing Australia. Chelsea and I headed out with the Kiwi girls for the day! We did some scouting where I got my second snapper. Jarrod and I were both lined up on it but with him not pulling the trigger I decided I would! About a millisecond later he pulled his trigger, but it was too late. I’d “stolen his snapper” and he gave me his choice of finger as I smiled pulling it to the surface! Sorry Jarrod. Chelsea and I had our snapper snooping down pat and were confident we could get a couple on comp day. We headed out to a pinnacle where I got my first two Pink Maomao, Karahu, and saw my first Mako shark that chewed Jarrod’s float line in half.Afterwards we headed out deep and trolled for Marlin for 3 hours. We didn’t manage to find any, but we were in the right spot as a fishing boat nearby was flying his red flag to show he was hooked up, later pulling in a Blue Marlin. It was good fun anyway. Brendon’s awesome RIB with a 350 Yamaha was luxury. We drank wine, boiled kettles for cups of tea and made salad sandwiches. It definitely wasn’t a boring afternoon and we were thankful that the girls had been nice enough to take us out. We look forward to bringing you the highlights from the competition early next week! Chelsea and I headed out with the Kiwi girls for the day! We did some scouting where I got my second snapper. Jarrod and I were both lined up on it but with him not pulling the trigger I decided I would! About a millisecond later he pulled his trigger, but it was too late. I’d “stolen his snapper” and he gave me his choice of finger as I smiled pulling it to the surface! Sorry Jarrod. Chelsea and I had our snapper snooping down pat and were confident we could get a couple on comp day. We headed out to a pinnacle where I got my first two Pink Maomao, Karahu, and saw my first Mako shark that chewed Jarrod’s float line in half. Afterwards we headed out deep and trolled for Marlin for 3 hours. We didn’t manage to find any, but we were in the right spot as a fishing boat nearby was flying his red flag to show he was hooked up, later pulling in a Blue Marlin. It was good fun anyway. Brendon’s awesome RIB with a 350 Yamaha was luxury. We drank wine, boiled kettles for cups of tea and made salad sandwiches. It definitely wasn’t a boring afternoon and we were thankful that the girls had been nice enough to take us out.